When Julie asked me if I would be willing to participate in her Spring 2012 Stencil Hop, my reply was a resounding yes. 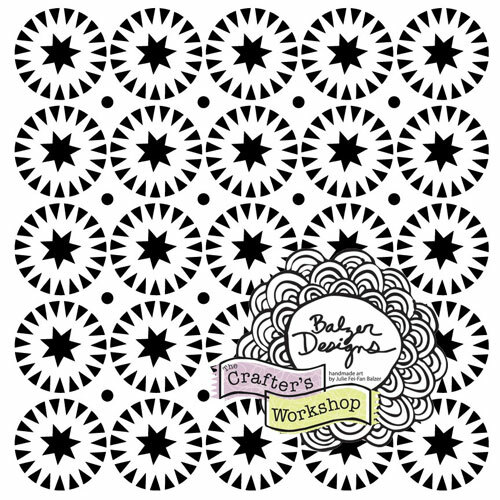 I am a huge fan of both Julie and The Crafter’s Workshop stencils. I am an even bigger fan of Julie’s The Crafter’s Workshop stencils! As soon as I got my stencil, the first thing I did was to create a collage page. But you’ll have to wait until tomorrow to see that one. Right after I was done, I couldn’t stop so I created two art journaling pages so I am here to share those with you. I used the circles template as a background for this one but it’s pretty loud and still a main part of my page. I think it supports the main star and the quote really well so I wanted to make sure it was a significant part of the page. 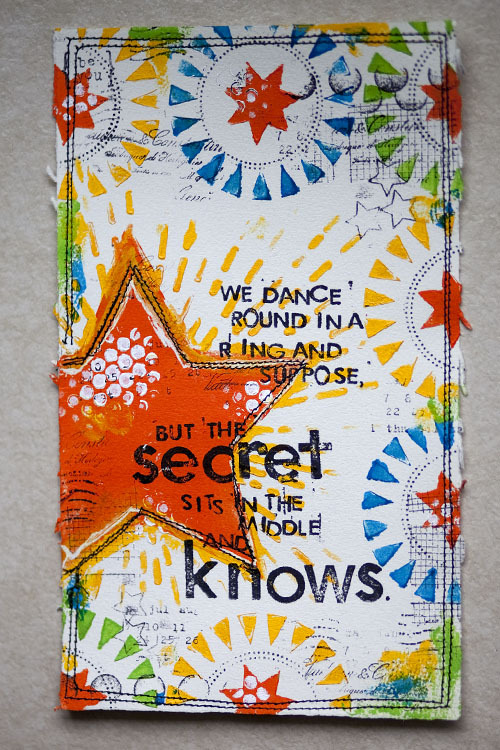 The other stencil I used here for the big star is also by Julie and it’s called Layered Stars. The quote is actually a Robert Frost poem that I’ve always loved. It says: We dance round in a ring and suppose but the secret sits in the middle and knows. I liked how the circles represented people dancing around in a ring and the star was the secret that sat in the middle. In this one I used the Stars and Circles template more like a background. I like that it adds color and interest to my page but doesn’t take away from the flowers in the foreground. I also loved that the circles fit perfectly in the middle of the Leaf Grid template, which is also by Julie and so are the flowers, which is the Poppies template. The quote on this one reads: Do not wait for others, go find your own joy. Step up and own your life. And then go back to Julie’s blog and leave her a comment for a chance to win this awesome template! Oh, and come back tomorrow for my collage post which will also use this very template! YUMMIE! Love Julie and the Crafters Workshop too. LOVE what you did with these, cannot wait what your collage page looks like! love the bright colors you used. both of them are beautiful! I love the vibrant colours you used!! Wow! This is stunning Karen! 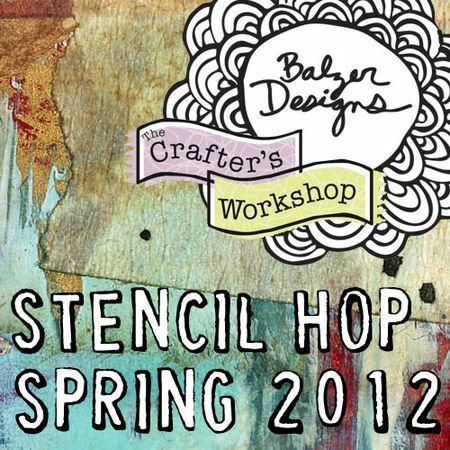 I am totally addicted to stencils, particularly the Crafters Workshop, but this one really was not calling to me. You really did a wonderful job of making me want to own it haha. Nice work as usual! I love both pages you did with the circle and stars stencil. I’m still learning to use them. 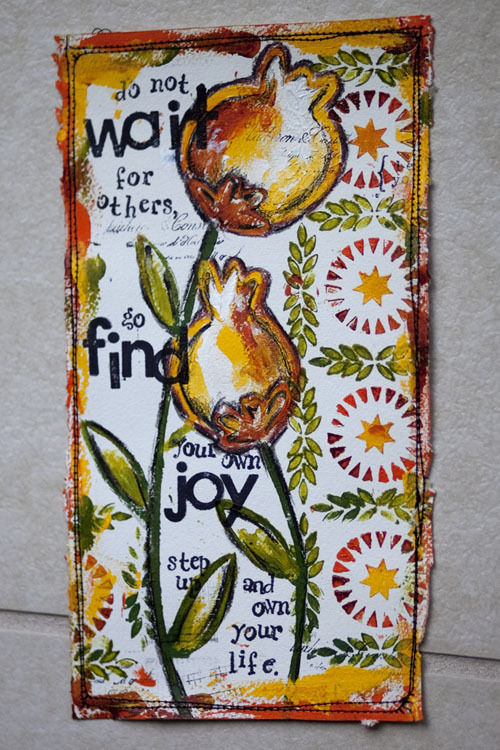 I love how you used so many of Julie’s stencils, and they all work together perfectly! LOVE IT!! Fabulous. Truly. I had never heard that Robert Frost quote. I love it. Great pages and I love how different they are. You’ve really showcased them. I also like how much white is still on the page. These are awesome! Love the bright colors of the first one and the rays on the stars. The second one looks so elegant. Both of these pages are so fun! I just love them. You have quite a way to take such a busy background and with a single image push everything back making it look beautiful. I am afraid if I did this it would look like chaos! Fantastic work! Pretty pages. Love the bright colors and your use of stencils. Excellent pages – I’m new to you from Julie’s and love your playful style. Thanks for the inspiration. Fabulous! Love how you incorporated her other stencils on the last artwork. Love the colors and design especially love the layering on the first card. Thank you for posting! I love both pages, you did an awesome job using the stencils. Can’t wait to see your collage pages. I love your projects the colors are so beautiful together! Thanks for the chance to win! Wonderful details and so cheery too. j’adore, ta page est superbe! I love your work!! I can’t wait to see the collage also!! I love the colors you chose – very beautiful!!! Love the cards! Great colors. And the quotes are perfect. WOW these are bright and happy pages!! Love the way you used the stencils on each one and can’t wait to see your collage tomorrow!! So nice to see you in the hop this time!! Love these! Really like the second page and the combination of the two templates. I love you pages, they are so bright and fun. Love these! They are awesome Karen. Your pages are gorgeous!!! I absolutely love how you incorporated the different stencils(the poppy is one of my all time faves!) along with quotes.Just beautiful! Gorgeous pages. I love that you combined so many different stencils. And your colors are fabulous. oooooooooh! love your takes on the stencils. i’m a red/white/blue person, but i love the bright colors you used on these. i espcially love the second one. the two stencils go together perfectly. reminds me of a baltimore album quilt. Karen, you rock! These pages are just jaw droppingly amazing! Thank you for being a part of the blog hop!